Beacons are structures that are permanently fixed either to land or to the sea bottom. The most common recognized are single piling type structures, but can also be more complex such as those mounted on the end of breakwaters or built on off lying dangers. While some lists show only (5) different types of buoys or beacons, incorporating "Safe Water Marks" into the Lateral Marks category, I have kept them separated. "Safe Water Marks," in essence have no lateral significance. In other words safe water marks can be safely passed on any side in any direction or circled endlessly without endangering your vessel. Special Features – such as sound signals (whistle, gong, horn, etc. ), and RACON’s or AIS Transponders, if your vessel is so equipped. The (3) items above, when taken together, are often referred to as the "light’s characteristics" and play a large part in identifying any Aid to Navigation at night. Some Special Features may also be available to aid in identification, such as sound signals, AIS Transponders or RACONS; again, if your vessel is equipped to receive them. Markings - Depending on the type of mark, it may be lettered, named, or numbered and in many cases you may see a combination of both numbers and letters. 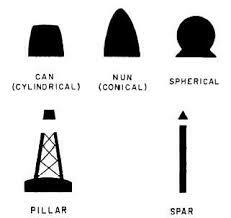 Shapes - There are five basic buoy shapes (see below): can, nun, spherical, pillar, and spar. With the exception of pillar and spar buoys, the shape of the buoy indicates the correct side on which to pass. Regardless of the IALA Region you are sailing in, when referencing lateral marks, can (or cylinder) buoys will always mark the port side of a channel when entering from seaward. Likewise nun (or conical) buoys will always mark the starboard side. The colors will be different between IALA-A and IALA-B, but the shapes will always remain the same. Can buoys are often referred to as cylindrical, and nun buoys as conical. The term pillar is used to describe any buoy that is smaller than a large navigational buoy (LNB). Lighted or sound producing buoys in the United States are often referred to as "Combination Buoys," but the correct term is "Pillar Buoy." Colors - Aids to Navigation can be solid colors or they may be horizontally or vertically striped of different colors. Regardless, there are only (6) colors used; Red, Green, Yellow, Blue, and Black. Topmarks - Five topmarks are used in the IALA buoyage system and consist of Cylinders, Spheres, X’s, Crosses, and Cones. When beacons are used as lateral marks, the cone topmark is often replaced with a triangle and the cylinder is often replaced with a square. The cylinder topmark may often resemble a rectangle or square and the cone topmark may resemble a triangle, especially at distances. Light Characteristics - If lighted, as mentioned before, a lights characteristics are comprised of (3) items; the lights color, the lights phase, and the lights period. Light’s Color - There are only (5) light colors authorized on marine ATON’s; Red, Green, Yellow, Blue, and White. Red, Green, and White are the colors most often encountered by the mariner. Yellow is seen regularly and Blue rarely. And that’s just "one" of the six primary categories of light phases! Even the most seasoned mariner is going to have trouble remembering all of these, especially some of the more infrequently used light phases. Light’s Period - This is simply the time, measured in seconds, in which the light’s phase repeats itself. There are a number of publications available to help in identifying Aids to Navigation and their characteristics, including: The USCG Light List, NGA List of Lights, and Chart #1. These are available and can be downloaded from our website or if you prefer hard copies; they can be found through the many links on our pages. Regardless whether you prefer electronic copies or hard copies the above listed publications should be carried on your vessel as part of your navigation library.